TAMPA, December 2013– Jurisdictional Bishop Matthew Williams has named Pastor A. D. Shaw as the new Chairman of the Jurisdictional Auxiliaries In Ministry Convention (AIM). Chairman Shaw succeeds Superintendent Roosevelt Watkins, Greater Palmetto District. Pastor Shaw, a former Vice-Chairman of the Jurisdictional AIM Convention, senior pastor of Shekinah Glory Cathedral Church Of God In Christ in Tampa, Florida. Giving his life to service in many arenas of the church, specifically the Jurisdictional AIM Convention since 1999, the new chairman brings a wealth of administrative and organizational skills to the position. Chairman Shaw, a graduate of Thomas Jefferson High School and graduate of Hillsborough Community College, holds an Associate of Arts degree in Secondary Education. With a passion for education and community, this innovative visionary leader who has impacted the local Tampa Bay Community in numerous ways. The founder of EMPAC19 (Empowering A Community 33619) , a task force of pastors and community civic leaders partnering with businesses and local agencies to better neighborhood families, Chairman Shaw also served as a member of the Advisory Board for Eckerd (Formally HKI) Child Welfare Department of Hillsborough County and currently serves as a Board Member of the Hillsborough County Children's Service Advisory Board. 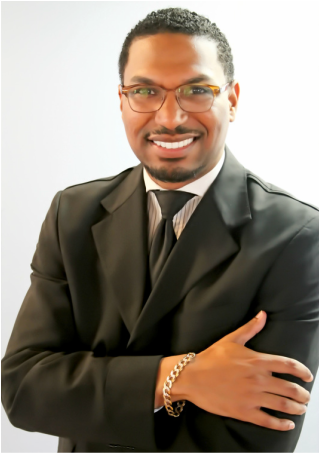 He was elected to serve as the Treasurer for the Tampa Bay Coalition of Clergy, Inc.
A servant leader, Pastor Shaw works within the International Church Of God In Christ AIM Convention as a member of the AIM Executive Staff Ecclesiastical Planning Commission. Pastor Shaw assumes leadership of the Jurisdiction of Southwestern Florida's summer convention that comprises five of the major departments of the church: Music, Youth, Mission, Evangelism, and Sunday School. The 2014 convention will be held in Tampa, Florida, at the jurisdictional headquarters, Brown Memorial Church Of God In Christ, June 9-13, with an anticipated 1,000+ delegates. The goal of AIM is effectiveness in ministry. Its primary goal is training for a more effective domestic and global outreach, and its mission is to advance Kingdom work through training, worship, evangelism, discipleship, fellowship and service. Chairman Shaw is blissfully married to the lovely Lady Michon Elizabeth Shaw. They share the blessing of being the proud parents of two precious daughters, Dichon Elizabeth and Louise Elizabeth Shaw. He was recently appointed to Regional AIM Chair Director of the Southeast Region.